Does anyone sell this kind of hinge for a sector? 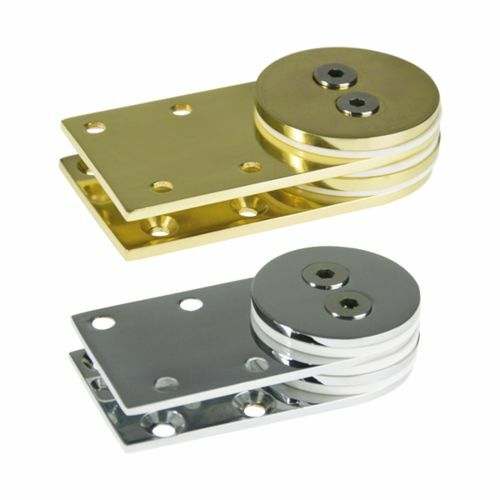 I’ve wanted to make a sector but have never found a particular kind of brass hinge. I’ve tried re-purposing a folding rule that has a small hinge, it’s not bad but it’s smaller than I’d like. I’ve seen others make sectors but without using this type of hinge. Does anyone sell this sort of thing in a large-ish version like the one here outlined in red? 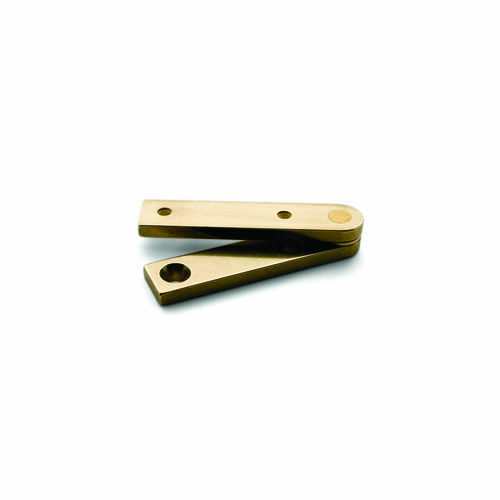 I’m afraid I don’t know what the sector looks like, but I did a search for “pivot hinge” And one came up like this…. there were many other types, too. Old Stanley folding rules like the No. 36 1/2 are available on eBay that use that type of hinge and it’s pretty large compared to the No. 32. I got an old one to take apart and salvage the hinge for my sector. With rules like the No. 32 you can also use the hinges for the folding legs if you want to implement that feature in your sector. I’d love to buy that issue of Mortise & Tenon Magazine, but it’s $24. Seems pretty steep for a magazine. Yes – photo is from the email on the latest M&T mag. 1.) wanted a larger hinge. 2.) 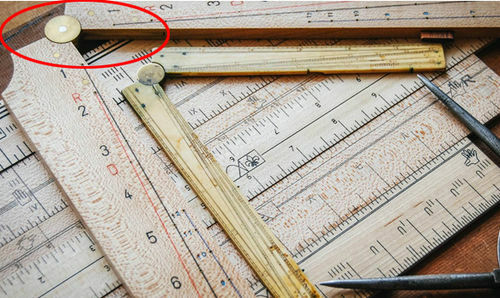 Or, could not figure out how to remove the brass sides and leave the circle part of the hinge AND attach a piece of wider wood, like the photo above I originally posted. I don’t think it’s possible to do that but I could be wrong, I didn’t take it apart. Don’t think the pivot and knife hinges would work for a sector. Actually just found a close-up of the hinge of the sector from the photo I posted above, and it used to be for sale but does not look like it is now. That stinks, I’d just buy his because it’s nicer than I could make. Emailed him to see what’s up. After watching the video on that sector, I understand why the pivot hinges are not the same and why they would not work. That’s why I mentioned the 36 1/2. The hinge is significantly larger, and they’re very common so the price is generally low, especially when the wood is dirty and not useful as a ruler. That sector was available on Jim Tolpin’s site, but I passed on it because it was almost $300. I figured I could make my own. Sorry, I didn’t see 36 1/2 at first, thanks for the tip. The pivot hinge will work if you can cut the plates in half lengthwise. 1 – Cut the plates in half right down the middle up to the round part. 2 – cross cut to remove the unwanted half of the plate. 3 – file or grind remaining unwanted part to make it round. use “opposing halves” of the plates to mount the wood parts. Sorry, I didn t see 36 1/2 at first, thanks for the tip. I know. That’s up in the Blue Spruce Toolworks price range. I found 1/16” OD brass tubing for the divider sockets. That seems like a pretty critical component for longevity. The hinge issue is solved, and I’m confident I can accurately locate the brass pieces. What’s got me at a standstill right now is the lettering. I can order some of those micro markers with 0.2mm tips in different colors, but I have no confidence in my ability to do that sort of precision lettering by hand. I know I’ll need to put on several coats of finish first to keep it from bleeding, and hopefully that will give me some ability to clean off any mistakes. I need to practice on some sample boards, but am pretty busy with other projects. If you make any progress on yours, please post it. I’ll do the same. Sorry, one question: how is the brass tubing used? Those are for the tips of the dividers to sit in to get a precise setting on the sector. There are two ways to make one — put the points for setting the sector on the inner edge of the legs (small notches help to index it) and set the sector to the first measurement by opening it to width. The other, and more accurate, way is to use the dividers to measure the part to be divided. 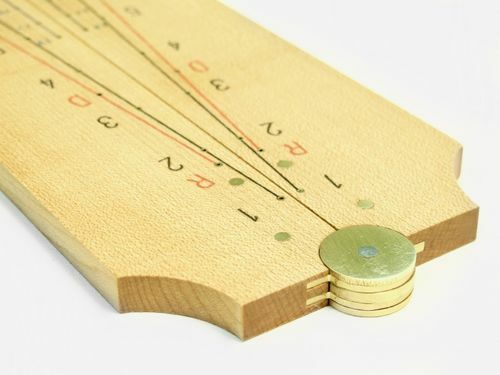 You can then set the sector to that opening so that the divider tips fit into the brass inserts at the location you want, and then set the dividers to the smaller setting using the inserts at the location that gives you the fraction you are looking for. In this method, the sector never touches the work piece, it’s all done with dividers. Understood now. Had to zoom in to see those. Dang tiny hole, 1/16”.